Early planting and nearly seasonal temperatures with continued adequate rainfall across the state have promoted very good prospects for Minnesota crops this year. With 77 percent of the MN corn crop in good to excellent condition and 74 percent of the soybean crop in good to excellent condition, crop producers and consultants are pleased with the growing season so far. Soil moisture storage is adequate in most areas of the state. Farmers are trying to catch up on weed control with cultivation or use of post-emergence herbicides. Some areas of the state have already received over 4 inches of rainfall this month, including 5.68" at Melrose, 4.45" at Sartell, 4.35" at Waseca, 4.28" at Owatonna, 4.06" at Austin, 4.47" at Caledonia, 4.28" at Zumbrota, and 5.11" at Theilman. It looks like the balance of June will continue to bring adequate rainfall and near normal temperatures, and hopefully we'll miss any widespread severe weather outbreak. The NOAA Climate Prediction Center released new seasonal climate outlooks this week. The temperature outlook for July through September in Minnesota calls for equal chances of above or below normal values prevailing, except for far southern Minnesota where probabilities favor cooler than normal conditions. The outlook for rainfall is similar, except for a greater probability of above normal rainfall across most of the southern half of the state. The Seasonal Drought Outlook for the balance of the 2015 growing season sees no return of drought conditions across the state. "Care for Our Common Home" is the title of the encyclical released by Pope Francis this week. This 180-page document frames a moral justification for "creation care" (what some others call Earth stewardship) in the context of the growing body of scientific knowledge that we are changing the planetary climate in ways that will disproportionately affect the poor and the disadvantaged, and continue to degrade the natural resources that we all rely on, resources created by God. Among the many statements contained in this document, one which caught my attention was "our care for the environment is intimately connected to our care for each other, and we are failing miserably at both." The combination of both moral and scientific arguments that we must face up to the challenges of climate change will likely provoke widespread and frequent public engagement during the coming election cycle. MPR's Tom Weber and I will be at the Barnes and Noble Bookstore in Roseville (Har-Mar Mall, 2100 N. Snelling Ave) Monday night, June 22, 7pm to talk about each of individual books, "100 Things To Do in the Twin Cities Before You Die", and "2nd Edition, Minnesota Weather Almanac." If you are around, please drop by, it would be great to see you. The summer solstice (longest day of the year in the Northern Hemisphere) will occur about half past 11am this Sunday, June 21st, as the sun passes directly over the Tropic of Cancer. This year it is coincidental with Father's Day. Minnesota citizens near Lake of the Woods (northernmost Minnesota) will enjoy a day length of about 16 and a quarter hours, while those citizens in Austin (southern Minnesota) will enjoy a day length of about 15 and a half hours. A new study published in Oceanography this week documents the changes in the acidity of portions of the Arctic Ocean, and suggests that the continued decline of calcium carbonate (in the ocean waters known as aragonite) may impact the ability of tiny shelled animals to exist in these waters. There may be further impacts on the fisheries of Alaska as well. Remnants of Tropical Storm Bill brought more heavy rains to portions of Texas and Oklahoma this week. Several climate stations in Texas reported over 10 inches of rainfall from Bill, including 12.68" at Bonita, 10.97" at El Campo, and 12.50" at Montague. Portions of Oklahoma also had rainfall amounts that produced flash flooding, including 10.09" at Burneyville, 11.52" at Newport, and 12.53" at Healdton. Many climate observers in those states are on pace to record their wettest year ever. Earlier this month the White House announced a new public-private partnership to provide Climate Services for Resilient Development. Highlighted in a report and press release were such statements as " new international public-private partnership promises to provide developing nations with data, information, tools, and training to help them become more resilient to climate change. That assistance could help developing nations better prepare for floods, droughts, sea level rise, and other issues." NOAA's Climate.gov feature this week on the distinction between "global warming" and "climate change' is worth a read. It reminds us that rising temperatures is but one attribute of the Earth climate system and all of its interconnected parts. There are some graphic illustrations, along with many research citations to put more detail into this topic. 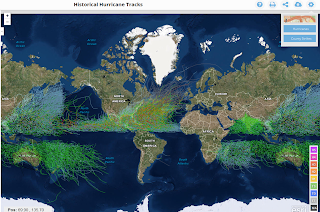 NOAA's Office for Coastal Management now offers a web site to view all historical hurricane tracks. Scientists reporting through the American Geophysical Union this week revealed a study of Alaska's melting glaciers, and how much meltwater from that state is flowing into the ocean. The rate of meltwater loss from the Alaska landscape has accelerated in recent years and is expected to contribute to a significant rise in sea level over the next century. Science Daily has a report on this. We live in Bloomington and it seems like the dew points have gone up this month to an uncomfortable level more frequently than they did in May. Is this true? Indeed, during the month of May the highest daily dew point rose to 60°F or greater on six days, topping out at 66°F on May 16th. So far this June we have recorded a daily maximum dew point of 60°F or greater 11 days, topping out at 70°F on June 17th. We will likely see a few more days with 60°F dew points before the end of the month. The average MSP high temperature for this date is 80 degrees F (plus or minus 8 degrees F standard deviation), while the average low is 58 degrees F (plus or minus 7 degrees F standard deviation). MSP weather records for this date include: highest daily maximum temperature of 100 degrees F in 1933; lowest daily maximum temperature of 56 degrees F in 1946: lowest daily minimum temperature is 41 degrees F in 1950; highest daily minimum temperature of 75°F in 1933; record precipitation of 4.13 inches 2014; and no snowfall has been recorded on this date. Average dew point for June 19th is 55 degrees F, with a maximum of 76 degrees F in 1953 and a minimum of 31 degrees F in 1992. The state record high temperature for this date is 108 degrees F at Beardsley (Big Stone County) in 1933. The state record low temperature for this date is 26 degrees F at Kelliher (Beltrami County) in 2001. State record precipitation for this date is 5.13 inches at Moorhead (Clay County) in 2000; and there has not been any snowfall on this date. June 15-20, 1933 brought a significant Heat Wave to Minnesota. The daytime temperature hit 100F or higher in dozens of communities around the state bring a great deal heat stress to crops and livestock. Nighttime temperatures remained in the 70s F, not bringing much relief from the scorching daytime heat. June 19-21, 1979 brought strong thunderstorms to many parts of Minnesota. Storm damage was inflicted by heavy rains and very strong downburst winds, measured up to 100 mph. Many homes and farm buildings were damaged by the winds, and a number of power lines were taken down. Some farm fields were flooded by 3 to 4 inches of rain. In Otter Tail nearly 5 inches of rain was reported. June 19, 2000 brought widespread frost to many parts of northern Minnesota. Embarrass and Tower both reported morning lows in the upper 20s F.
In the middle of the drought year of 2012, June 19-20 brought flash flooding to portions of Carlton, St Louis and Lake Counties. Jay Cooke State Park was seriously damaged and nearby Highway 210 was washed out. Duluth and Two Harbors were flooded by 7-10 inch rainfall amounts, causing millions of dollars in damages. Warmer and more humid over the weekend with a chance for showers and thunderstorms Saturday through Monday. Some storms may be severe. Cooler by Tuesday through Thursday with a continuing chance for scattered showers and thunderstorms.